Our very own Ian Metler and Micole McCarthy collaborated to create a fabulous holiday tree out of some bits and pieces and miles of LED lights. Come see for yourself during one of the many fun things we have going on in December! Let’s make taking a family holiday picture on the amazing and gigantic chair in the VCA lobby an annual tradition. We’ll be adding more garlands and fun bits and pieces from now until December 22, but really, come any time. We’re here weekdays 10:00 – 5:00 and on Saturday noon to five. If you’re dressing up to come to a performance, what better time! This weekend we’re taking down the fabulous Wordless Stories show (and getting ready to hang what looks to be a fabulous miniature show). 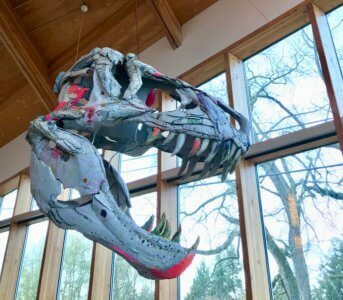 While I mourn the leaving of so much great art, I’m giddy at the thought that Scott Fife has generously agreed to leave the magnificent T-Rex, Ancient Log, and Popeye in our atrium through the end of the year! 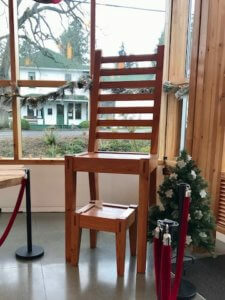 Combined with the Holiday Tree of Lights and the Giant Chair, I think it safe to say we’ve gone BIG! I can’t say for sure how many times I’ve seen this classic ballet, but count me excited about our upcoming Nutcracker. The energy around the building is electric and exciting. Who knew there were this many dancers on the island? And what about the dancing parents? So much activity, so much fun. Get your tickets now! And while you’re bouncing with anticipation, come on down to the holiday tree lighting on Saturday around 5:30. The fun will be centered in front of Island Queen. Some of our fabulous dancers will do a show starting around 6:00 . . . ballet, tap, and Mexican ballet! I’ve been banging on about the poetry reading we just had Thursday night for a couple of weeks now. I’m writing this just 20 minutes past the reading of the last verse, and I am nearly the typing equivalent of speechless. Regular readers will recall I am referring to a reading of poems that were written in response to the stunning “Wordless Stories” exhibit that has been on display in our gallery and atrium this month. Well the whole experience was breathtaking. A far larger crowd than any of us expected showed up and filled our gallery to the edges. The group was salted with poets, friends, the showing artists, more friends and possibly a few who just followed the crowd. Round the room we went, a poet standing to read his or her verses beside the work that served as inspiration. It was hard to know where to look . . . at the poet, at the work, or at the face of the artist listening to the words completing a cosmic circle round art, artists, poet, poem, audience, and gallery. One of the artists, John Overton, told me after that he had to fight to hold back tears listening to the verses inspired by his lovely work. Eric Nelson, a man never at a loss for words, said it left him “nearly without words.” Mark Bennion had a smile as wide as all outdoors when I asked him what it was like to listen to his painting read as poem. Clearly we have discovered together something we shall have to explore more fully, this melding together of artistic forms. Something definitely is happening here! And this is a sixth thing. I’ve been listening to an amazing vocalist called Edda Glass and her partner in music, Max Hat. There’s a reason why which we’ll announce shortly. In the meantime, enjoy!